One of the more difficult aspects of personal finance is figuring out the best way to utilize our money. For the Millennial generation, especially, it’s tough to figure out how to save big on a small budget. But, the key to lessening your spending is to cut back a little in each area. It may take a little work in the beginning but you'll find your financial stress start to decrease once you're able to save and pay off more of your debt. Here are 8 simple but effective ways to cut back on your expenses. 1. Put any bonuses into savings. There’s no better feeling than finding $20 in an old jacket pocket or while you’re cleaning out your car. Instead of pocketing that cash and potentially losing it a second time, pay yourself first by automatically depositing it into your savings account. 2. Make meals at home. It can be tough to find the energy to make a meal after a long day at work. Start out with the habit of cooking at least twice a week, if you eat out often, and slowly build up to three or four times a week. If that’s not realistic for you, find time on Sunday to meal prep a few easy dinners for the week. This way you’ll have a meal ready to go when you come home from work. The same goes for coffee. Buying a coffee every day can seem like a small expense but it really puts a dent in your wallet in the long run. 3. Make a grocery list before going to the store. 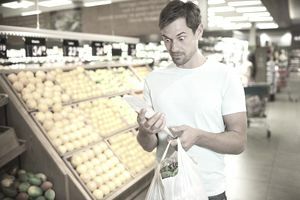 If you’ve ever gone to the grocery store without a list or when you’re hungry it can be tempting to buy more food than you normally would. Pre-plan what you will need for the week before going to the store to not only make sure you don’t forget anything but also to avoid picking up extra items you don’t need. A list helps make sure you avoid making another unnecessary trip and temptation. 4. Set a shopping limit. Make it a habit to avoid buying things on impulse. If you find yourself wanting an expensive coat you stumbled upon at the mall, wait a day or two and see if you’re still thinking about it. This also allows you to check online for a better deal or discount. 5. Clean out your closet and sell what you can. As spring approaches, it may be time to go through your closet and get rid of the items you never wear. These clothes just take up extra space and could potentially earn you some extra cash. Once you’ve done some deep cleaning look into hosting a garage sale or sell some of your items to a consignment store. 6. Cancel club memberships or entertainment bills. It can be easy to forget about our automatically reoccurring monthly bills. If you have a gym membership that you’ve always had but never use it may be time to cancel it. Additionally, if you have cable but find yourself mostly watching Netflix see if it makes sense to cancel your cable bill. Spending $100 a month on cable may not seem like a lot on a monthly basis but that's $1,200 a year you could be saving! Eliminating the extra expenses you rarely use could make a significant difference in your budget. Instead of going out to buy a new face mask, see if you can make one with the items you already have at home. Pinterest is a miracle tool for DIYers. Use it to find free, easy recipes for meals, cleaning hacks and ways to use the most out of things you have around the house. 8. Use a budgeting app. It’s easy to overspend when we’re not setting limits and holding ourselves accountable. Some apps like Mint and Quicken can help you track daily, weekly, or monthly spending to see where you need to cut back and receive personalized advice based off of your financial needs and goals. Of These 8 Investing Styles, Which One Is Right for You? Is Your Costco Habit of Buying in Bulk Costing You?